This is a sawed slab of rock that has been wet with water before photographing. Rounded gravel particles mostly toward the upper size range of granules (4-64 mm). Lithic fragments include chert, meta-sedimentary rocks, milky (metamorphic) quartz, and occasional igneous rocks and micrite limestones. The matrix (material filling the spaces between the granules) is mostly sand, mixed with silt, and clay. The gravel fragments tend to be elongated, but do not show a preferred orientation (i.e. are not imbricated), indicating they were probably deposited during mass transport (e.g. debris flow such as a landslide or underwater avalanche). In context of the outcrop this rock was deposited subaqueously (below water). Conglomerates this immature are associated with regions of high tectonic activity, typically relatively close to the sourceland. The paucity of quartz, the large size of the particles, and the poor sorting speak of short time of weathering and short distances of transportation. 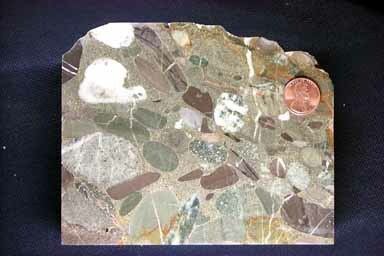 Rocks such as this are often deposited in "fan deltas"
This particular specimen is the Fincastle conglomerate from the Ordovician Taconic orogeny of Virginia. From the context where it was collected it is known to have been deposited proximally in a submarine fan very near a complex volcanic arc sourceland.